British reporters and press photographers in the early 1960s had it made. The Beatles, the biggest pop phenomenon of the decade, were the hardest-working foursome around, eager to offer interviews and pose for pictures amid the endless rounds of recording, performance and travelling. It's a far cry from the carefully managed PR machines that followed later on. Some members of the press corps were better placed than others. Among the lucky few was Don Short, the Daily Mirror journalist who first encountered The Beatles in June 1963 and became enchanted with The Beatles' music and personalities. He was the first to use the word Beatlemania in print, and was given a carte blanche to report on The Beatles, often working closely with The Beatles and their management in a range of exclusives. Don Short was at Shea Stadium in 1965. He was at the Bel Air house when The Beatles were experimenting with LSD. He became a close friend to each member, being mentioned in Lennon's A Spaniard In The Works, was given a mantra by George Harrison on the road to Rishikesh, and was on the group's chartered plane in Portland, Oregon as the engines failed and he and Lennon scrabbled to write final goodbyes. But Short's biggest scoop came in April 1970 and was headlined "Paul quits The Beatles", in which he broke the news that the world didn't want to hear. Short provides the introduction to Andy Neill's fascinating book Across The Universe: On Tour And On Stage. The book chronicles The Beatles' live performances from their first days to their final tour dates of 1966, accompanied by photographs from the Daily Mirror archives. And what a treasure trove Neill presents. 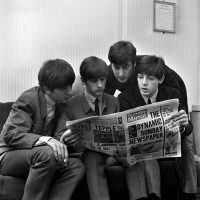 In the 1960s the Daily Mirror was Britain's highest-selling tabloid, which was quick to capitalise on The Beatles' ability to shift copies by the million. Many of the photographs in Across The Universe have never been seen before. Others were first published in The Beatles Files by Andy Davis, a 1998 book now out of print. Some come from the Sunday tabloid The People, the Daily Herald from Glasgow, and from the agency Syndication International. Photographic collections of The Beatles are nothing new, with collections by Dezo Hoffman, Paul Saltzman and Robert Freeman having published celebrated collections of the group. Of the British newspapers that were so well-placed to report on the story of the 60s, however, perhaps only the Daily Mail assembled a comparable archive. Starting with September 1963, Andy Neill's book chronicles The Beatles' stage appearances day by day, with accounts and photographs from the most significant dates. It's all here: reproductions of contemporary press reports, backstage shots, newspaper cartoons and numerous photographs of Beatlemaniacs worshipping their idols. Shots of the Cavern, autograph books, ticket stubs, images from inside EMI Studios, and various playbills and tickets adorn the pages and provide a dimension other Beatles histories cannot. 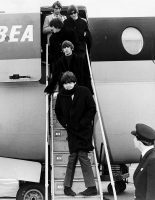 Among the press clippings are reports from the all-night seige at London airport as fans waited for The Beatles to return from America in 1964; the stormy reception in the Philippines where the group was jostled at the airport; and a fascinating interview from November 1966 headlined 'At the crossroads', in which The Beatles denied split rumours, anticipated their musical progress, and dismissed those clamouring for more live shows. The photographs aren't just of The Beatles' public side. Several are taken from the side or rear of the stage as they played, giving a unique perspective of the group at work. Elsewhere the group are shown preparing for shows, boarding planes, or in cars being driven from hotel to show to hotel to show, always looking immaculately turned out. There are also plenty of pictures of The Beatles in America, both on and off duty, giving a small insight into the maelstrom in which they lived at their peak. They're pictured with Shirley Temple and her daughter, with French chanteuse Sylvie Vartan in Paris, and with Brit actress Julie Christie. Everyone wanted a piece of The Beatles; it's a wonder they ever had a moment of privacy. Few accounts of The Beatles' career in the 1960s can compare with Mark Lewisohn's The Complete Beatles Chronicle, the exhaustive guide to the minutiae of their public activities. Andy Neill's book isn't an in-depth substitute, but it does give a fascinating visual documentary of their development in the public eye. Even Beatles obsessives who think they've seen it all will find much here to savour.